I have finished spinning two more colors from my Procion MX cotton lint dye experiments. The dime in each photo reflected the flash, which is annoying, but the yarn colors are pretty accurate, so I decided I could live with the dime. Thirteen in all, each roughly 100 grams each. 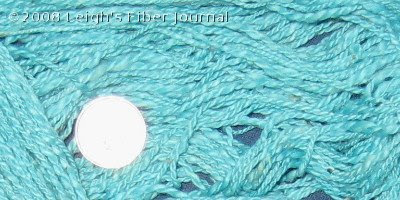 I still have more dyed cotton lint to spin, mostly from the Procion MX exhaust experiments. However, I'm ready to get back to some winter type projects such as knitting on my Shetland Sampler Cardi, and combing and spinning the Polwarth/Alpaca blend. 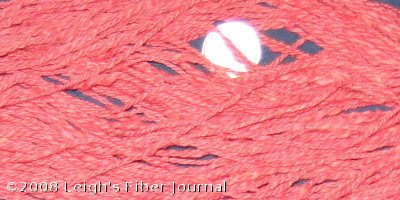 I've been toying with the possibility of weaving with my cotton yarns, but nothing concrete is in my mind yet. For now, they will be lovingly stored away, but be assured that an idea for them will be slowly percolating in my mind. All I can say is Wow! I love all the colors, what are you going to make with them. I really need to try cotton. Everyone one of those skeins is beautiful!! They deserve a special project. Can't wait to see what you do with them. The color wheel of your yarns is spectacular - it represents so much time and thought. I certainly understand your wanting to set them aside so you can think on how to use them. WOW, those are just flat out beautiful! I'm with bspinner - can't wait to see what you do with them! T.
I'll just echo all those Wows (Wow-ow-ow...) because those are beautiful skeins and I am so impressed that you spin cotton. I had one tiny go at spinning cotton but promptly gave up in frustration. 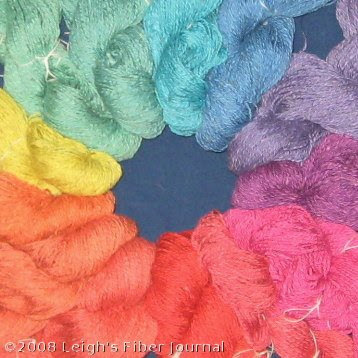 nice colours, Leigh - but I am with you on not wanting to work with cotton that much during this time of the year. somehow warm, fluffy things seem much more attractive right now! what are your plans for the winter? Thank you for your compliments! I dearly love rainbow type spectra of color. I agree that cotton spinning can be frustrating at first, especially if one is used to something long stapled. It can be conquered with lots of twist and patience. Once one gets the hang of it it actually spins up quite quickly. Woolly Bits, I think I need to switch to Christmas gift projects. Last year I had these done by September, but this year I've been too busy with other things. Leigh, those look WONDERFUL! You're making me want to break o0ut my procion right now for those lovely bright colors on my punis. It's a great versatile weight you chose as well. I can't wait to see what you come up with in terms of projects for these. Oh my gosh. Amazing. As a brand-new spinner (just learned *today*), this is mind-boggling. Wow!!! Kristin, that's great! You will fall in love with spinning. And wait till you start being able to weave with your own handspun! I real joy.